Sunday, January 15, 2017 marked the beginning of a new chapter for Friendly Church of God in Christ. The history of Friendly COGIC is a true life story of a God given vision. A story that until recently only contained two chapters of pastoral leadership. As most readers know, chapter one sets the foundation of any story. For Friendly COGIC chapter one starts in 1952 with Superintendent Cleveland Wood, Friendly’s founder and first pastor. After 32 years of shepherding, Pastor Woods then handed the proverbial pen to the young Elder Leroy James and so chapter two began. When asked, those that lived in both chapters and grew up in the latter often note that those times were some of the best chapters of life. Now after his 32 years of service and commitment to the continued success of Friendly, Pastor James has passed the pen for the next chapter to be written. Friendly’s next chapter of leadership officially began Sunday with the installation of Elder Willie Boyd Sr. as Friendly’s third pastor. Elder Boyd and his wife Missionary Patricia Boyd along with their family have been members of Friendly since 1999. Throughout the years they have served in various positions and now their newest appointments of Pastor and Elect Lady. Friendly members, the Augusta District church families, friends and guests all came to be a part of the installation service. Pastor Boyd noted earlier in the day that he was extremely excited to have many of his family members present to witness this important time in his life. At 3:00pm the service began with Augusta District Superintendent Mark Walden as presider and a selection from the Friendly Combined Choir. The program featured several Augusta District pastors, many of which at one time served at Friendly. Bishop Mark Walden, Northern Georgia Second Jurisdiction Prelate, provided the message for the occasion. Bishop Walden addressed the transition of leadership, the weighted responsibility of pastoring, and the characteristics of a Godly leader. 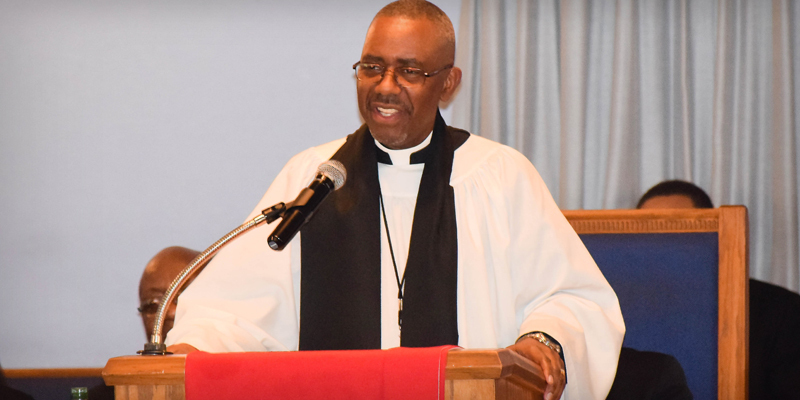 He shared wisdom from his pastoral experience with the congregation and emphasized the importance of the charge given to those in leadership positions. The man of the hour, Pastor-elect Elder Willie Boyd Sr. and Miss’y Boyd had a front row seat as they sat on the first pew in the congregation. After the message, Bishop Walden called Elder Boyd to the front of the church for the main purpose of the service – installation of pastor. After Elder Boyd affirmed his oaths to faithfully perform the office of pastor he was bestowed the vestments of a pastor, then making him Pastor Willie Boyd Sr., pastor of the Friendly Church of God in Christ. Bishop Walden called all ordained pastors and elders to surround him. Kneeling, Pastor Boyd was prayed for that God would cover and lead him in the position of pastor. The role of pastor is significant and a pastor’s wife is no exclusion. As Bishop Walden called Elect Lady Boyd for prayer, he asked the Pastors’ wives and missionaries to surround her and pray as well. The prayer was a petition that God bless her as she supports her husband and grant her wisdom as she takes on her own role as Elect Lady of Friendly. With change comes moments of reflection. Bishop Walden took a moment to spotlight the leadership of Pastor James and Elect Lady LaDoris James. With applause and some tears, we remembered and treasure the legacy of dedication they have wholeheartedly given Friendly COGIC. To conclude the occasion guests were invited to dinner in the fellowship hall. As you entered the fellowship hall, you were met with linen covered tables, glass goblets, and decorated place settings. Decorations in a white and black color scheme were found throughout the dining area. The extra special touches reflected the importance of the day’s event.